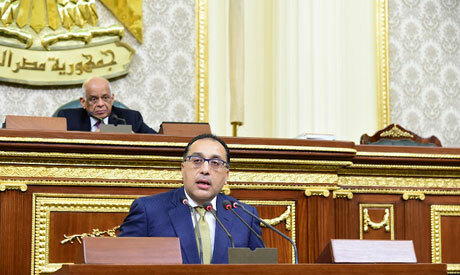 Prime Minister Mostafa Madbouly presented to parliament on Tuesday the policy statement of his newly formed cabinet, as per the country's constitution, highlighting his cabinet's policy priorities. Madbouly and his cabinet were sworn in by President Abdel-Fattah El-Sisi on 14 June, replacing the cabinet of former prime minister Sherif Ismail who resigned earlier that month. The prime minister said during his 20-minute speech to a full parliament session that the economic reform programme which has been carried out by the government since 2016 is 85 percent accomplished. Madbouly vowed that one of the government's main focuses in the coming period will be to provide a support system for citizens in order to mitigate the effects of the reform programme. "The Egyptian citizen will feel a tangible improvement," the prime minister said. Article 146 of the constitution stipulates that a newly appointed prime minister must deliver a policy statement before parliament, after which MPs should vote on the policy, in a process that ends within 30 days of the appointment of the prime minister. The new cabinet attended the parliament session. Madbouly said the five main priorities for the nation up to 2030 are national security, improving living standards, continuing economic reform, human development and foreign policy. Madbouly outlined the cabinet's vision in the program dubbed "Egypt Takes Off." Addressing national security, Madbouly stressed that his cabinet will continue to support the armed forces and the interior ministry. He also said that his cabinet will not only be working on public safety for citizens’ security but also on food, water and energy security. On improving living standards, Madbouly discussed the cabinet's plan to build a total of 1.1 million residential units, to improve traffic rules, improve transportation services, and establish new sanitation networks and many other services. The PM will keep the housing portfolio he oversaw in Ismail's cabinet in the cabinet he now leads. Madbouly promised citizens that the benefits from implementing economic reform will come to fuition soon. "Nine hundred thousand job opportunities will be created in total in each of the coming years," said Madbouly. However, Madbouly cautioned that the results will not be felt if the current rate of population growth persists, explaining that the cabinet will work on family planning awareness campaigns with a total funding of EGP 250 million. On human development, the cabinet will modernize the education and testing systems, and work on opening new national and international universities, as well as upgrading in the health sector. "Egypt is looking forward to a balanced policy with all global powers," said Madbouly speaking of Egypt's foreign policy.